At the same time I had decided to buy my Rancilio Silvia with PID, I knew I needed to budget for an espresso grinder. This was something I didn’t think was necessary before. But, based off my experiences, I would absolutely agree you should first get a good dedicated espresso grinder. It really is that important that you grind the espresso well. It needs to be fine and consistently so. Many references online even indicate that the espresso grinder is more important than the espresso machine. Because the way the coffee is ground affects the extraction process. The espresso machine just delivers the water. While the grind is what leads to proper extraction. The Compak K3 Touch Espresso Grinder has been excellent at that. Prior to getting the Compak K3, I used a Rancilio Rocky Doserless Grinder which I didnt like. Old grinds would sit in the chute after using it. And, I could not get the grind right. This was especially a problem when switching beans. The reason for this is that it is a stepped grinder. The grinder does not allow you to make minor adjustments to the fineness of the grind. So when you want to go more fine or less fine, you have to click a step up or down. This can over extract or under extract your espresso. There are modifications you can make to compensate, as many people do. But in my opinion I don’t think you should pay $350 for a grinder that doesn’t do what it should. So, that is why I bought the Compak K3. The Compak K3 Touch Espresso Grinder is a doserless and stepless espresso grinder. I did research some of the other highly rated grinders. However, I didn’t want one with a massive hopper or one that took up a lot of space. I initially planned to use this for all grinds of coffee. Including french press, drip and espresso, but that was not a good idea. It is a hassle to keep switching between different sizes. Also, when adjusting, the grinder must be running so beans don’t get stuck. This can occur when going from less fine to a finer grind. So now I have the Compak K3 as my dedicated espresso grinder and have a Capresso that I use for drip and french press. On the Compak K3, I put blue painter tape on the scale so I have a good idea as to where the grinder should be set for espresso. You want to aim for an ideal brew time of 2 oz in about 25 seconds. Depending on the darkness of the roast and how fresh the beans are I make minor adjustments to the grinder based on the volume/brew time. The Compak K3 has a timer function which I always use to get an approximate weight of 16-18 grams. So all it takes is two taps for a double shot right into the portafilter. Otherwise one tap is one shot. You can also go manual and hold down the metal lever to get the desired amount. So, that was my story on how I ended up with the Compak K3. 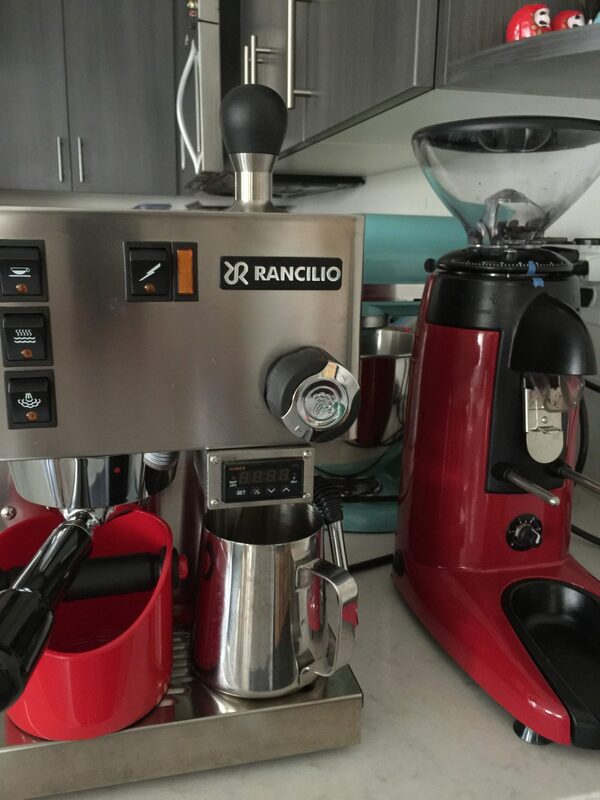 If you missed it, you can read about my Rancilio Silvia v4 PID Espresso Machine as well as the accessories I use to fulfill all my espresso needs!! You can find the Compak K3 Touch Espresso Grinder on Amazon. Here are some videos of me using my espresso equipment. Awesome! I’ve been looking for reviews of people that went from a Rocky to a Compak K3. I’ve yet to buy my first grinder and after reading this my doubts about the Rocky have been confirmed; lack of timer, not stepless, messy/clumpy chute. While the Rocky is undoubtedly a great grinder, I don’t want to get that feeling of needing to upgrade after just a couple of months and the Compak is ‘only’ 50 dollars more..
How is the clumping on the Compak K3? Does it grind better than the Rocky with less clumps due to the different chute and bigger burrs? I noticed slight clumping with darker roasts but not much. overall i’m quite happy with it! Sweetmarias had it on sale last month for almost half what i paid, may be worth checking out!